Linux kernel 2.6.0 out and mirrored again at work: http://archive.cs.uu.nl/mirror/Linux/kernel/v2.6/. SCO Unixware 7.1.3 review (SCOX). Besides SCO being a pain in the neck of the Linux community their products are lousy. Current e-mail spam rate: 243.5 spam messages per day. This week I had the 'pleasure' of reviving an old MS-DOS system. bios detect it and set it up. Linux is fine with that. MS-DOS isn't. with FORMAT of MS-DOS 6.22, booted. Corrupted C:. drivers for ide cd-rom under MS-DOS. Ja ik ben lang en ik fiets lekker door, maar daarom kan ik het nog niet waarderen als je minder dan een halve meter achter me fietst. Updated Kismet Log Viewer so the generated pages use mapquest URLs which are a lot more useful here then US census URLs. Results show nicely in that second train trip from last weekend. Sitting in a train with my laptop running Kismet and enhanced with a gpskit I logged several wireless networks and even managed to get a location fix for part of them on the second day. Kismet log view from the first trip and the return trip. Tip: GPS reception in a NS train is flaky, try the upper level and stick the antenna to the upper part of the window. Do note the logged speed from the GPS: the train went up to 144 km/h. The first really public RSS feed I created is for The Virtual Bookcase where I created an RSS feed of new reviews. Made my first RSS feed (not of my homepage, because then it would be a blog which it isn't). Using available modules, that is quite simple. The resulting RSS 1.0 feed shows dublin core metatags, which reminded me of web projects at Cetis ages ago. Created findnumber to look up phone numbers (from isdnlog) in the backup of my Palm addressbook. Installed mod_gzip on the webserver serving you this page. Checking results for output from The Virtual Bookcase where large html pages are served a lot. The Friday Afternoon URL page has been enhanced with a linkchecker. Mirjam has her own homepage with favicon.ico (don't miss it). Warbiking around my house in Utrecht. Three access-points with default as ESSID and WEP disabled. Write-up about my experiences with installing Linux on the Dell Latitude C640. First experiences in wardriving/warwalking (finding wireless networks). 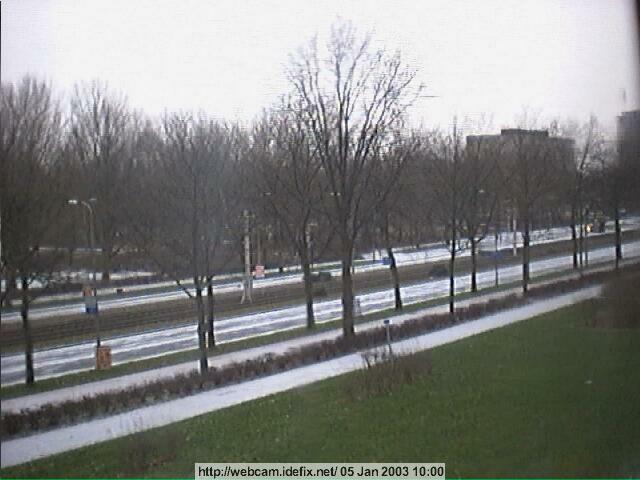 Walking around in the Uithof, Utrecht from one building to the other and driving Utrecht-Uithof to Culemborg and back. Data gathered with Kismet and converted to HTML with Kismet log viewer. Programmed all TV channels in my TV. Counted them. 35. Tried them all. Nothing on. I got a load of topsitez spam today and found a nice page which confirms that topsites are sending spam for their directory listing scam. Don't fall for this scam! New things at The Virtual Bookcase. The first feature article about a quite interesting book Weapons of Mass Delusion: America's Real National Emergency. The article framework uses HTML 4.01 and the first stylesheet (finally.. stylesheets). Removed the last of the coax network at home. But my cat Vlekkie disagreed on the total removal and I took a picture. Quagga coolest ever open source routing software replacing Zebra. Yes.. I have a girlfriend. *bounce* happy. to work so I can see the daily progress. one of these houses dissapear by driving through it does the work. windowframes from metal (heating, pipes) and any stone (the walls). I took some pictures of this whole process. in concrete blocks and wood. In the third picture, a wooden beam (part of a windowframe) gets removed. The crane uses its very controlled power to just grip the beam and remove it. The work is done by Van Vliet Sloopwerken. Back from another trip.. I've been walking in Iceland. Mail for URL for the pictures. Visit the [URL expired] Madonna remix project. Pictures from my Scandinavia trip are on-line now. Mail for URL. Back from a camping trip around Norway and Sweden. New northernmost location I visited: N66'49" E15'30" Mapquest link. Topsnelheid op mijn fiets wind mee helling af was zondag 49 km/uur. In a home, that is too much noise. First step: finding instructions how to open it. It has 2 Papst 612 NG fans on the inside (12V, 200mA). Size: 60x60x25 mm. And a generally nice and clean design on the inside too. of their products. So I downloaded the catalog. either the 612 NGMI (sleeve bearing) or the 612 NMI (ball bearing). which leaves a lot of room for resonance. Sign the petition against a remake of the movie that is one of the true classics: Casablanca. Digitenne geeft een mooie steek onderwater naar upc in haar nieuwsbrief: In Amsterdam kunt u dan ook zonder satellietschotel aan de gevel weer naar Discovery Channel en Eurosport kijken, en nu zelfs overal in en om het huis dankzij Digitenne. Digitenne begint 23 april met DVB-T (Digital Video Broadcasting) in de regio Amsterdam/Almere. Write-up of our April 1st joke: the helpdesk autoreply AI bot.. using the bofh excuses. By popular demand, my picture site has been updated with a main index of the public stuff. Fixed the focus on my webcam so you can see again what is happening. My best guess is my cats have touched it again. War, what is it good for? absolutely nothing, other then interesting creations here, here and Collected by jwz. I bundled the scripts I use to collect ntp stats in mrtg so other people can enjoy them too. Back from a week snowboarding in Les Gets. Deeeeeep powdersnow and my snowboarding has improved. I got mentioned on slashdot.. sort of. An explanation for the white stuff outside. It is snow. Cool Mozilla trick: bookmark http://teletekst.nos.nl/gif/%s-01.html and then set the keyword to txt. Typing txt 192 in your mozilla bar will give you teletekst page 192. 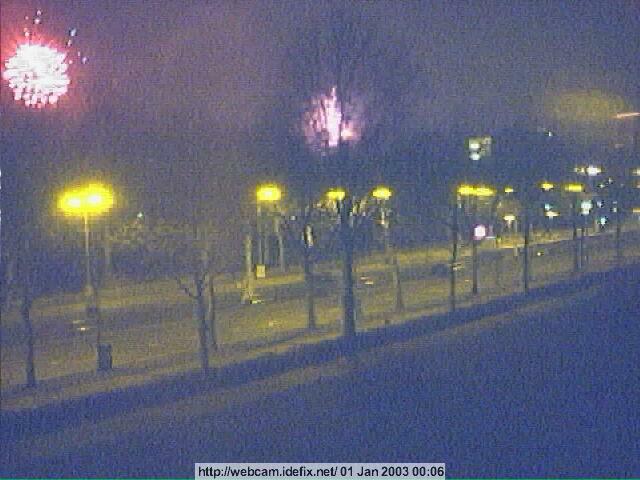 Happy new year to all visitors.. with the fireworks image from my webcam. This page generated by $Id: morenews.cgi,v 1.45 2019/04/02 09:26:15 koos Exp $ in 0.048098 seconds.